Bulgaria: Hezbollah Was Behind Terrorist Attack-Will EU Stop Appeasement? A big issue for the EU is whether or not Hezbollah is a terrorist organization. France and Germany have been resisting U.S. efforts to have the E.U. designate Hezbollah a terrorist entity (what’s the big deal they target Jews). U.S. officials have been blunt regarding what the administration thinks about the European stance. In October 2012, John Brennan accused the Europeans of making “it harder to defend our countries and protect our citizens” and of helping to “enable [Hezbollah’s] terrorist activity. ” There have also been Congressional letters, private discussions, and public statements — but so far France and Germany have refused to let the E.U. blacklist the group. Bulgaria: Hezbollah Was Behind Terrorist Attack-Will EU Stop Appeasement? Their objections to declaring Hezbollah a terrorist entity may become difficult to sustain now that the Bulgarians a member of the EU have linked Hezbollah to a terrorist act committed on their sovereign territory. established that two were members of the militant wing of Hezbollah. 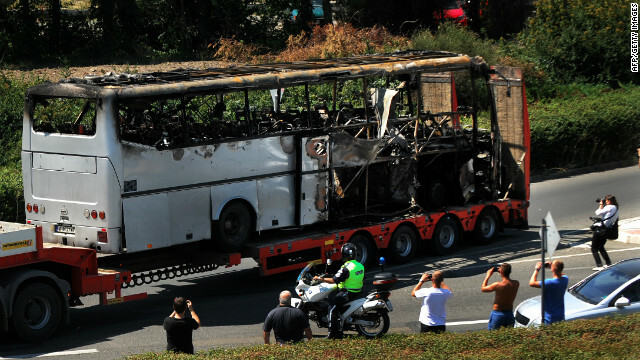 The July explosion on a bus carrying Israeli tourists in Bulgaria came on the 18th anniversary of the attack on a Jewish community center in the Argentinian capital of Buenos Aires bringing Iran under suspicion. Seven people were killed and about 30 wounded in that explosion in a parking lot outside Burgas Airport, on the Black Sea. The Bulgarian conclusion that Hezbollah was behind the attack may also make things a bit messy for Lebanon’s coalition government because the terrorist group is part of the coalition. The EU has continued its policy of terrorist appeasement in its dealings with Hezbollah despite the fact that it is also a threat to the United States and the Muslim countries of the Middle East. A State Department factsheet describes Hezbollah as behind the 1983 bombing of the U.S. Marine barracks in Beirut, the 1984 bombing of the U.S. embassy annex in Beirut, and the 1985 hijacking of TWA Flight 847, murder of a U.S. Navy diver. It alludes to the kidnappings and multi-year tortures of U.S. government officials, for which U.S. diplomat Fred Hof insisted Hezbollah owes a “blood debt.” And a U.S. court found in 2011 that Hezbollah had “aided, abetted, and conspired” in the attacks on the U.S. embassies in Kenya and Tanzania in August 1998. In Syria, Hezbollah fighters are currently fighting on behalf of the Bashar al-Assad regime. In Lebanon, four Hezbollah members were indicted by the U.N.-based Special Tribunal for Lebanon in 2011 for the 2005 assassination of Lebanese Prime Minister Rafik Hariri. That same year, Hezbollah was linked to attacks on peacekeepers in southern Lebanon. In Iraq, senior Hezbollah operative Ali Mussa Daqduq was captured in 2007 with detailed documents outlining attacks on Iraqi and Coalition Forces (http://is.gd/khP3L7). A year before U.S. intelligence officials detected a “strategic decision” on the part of Hezbollah to assist Iraqi Shiites. In Turkey, Hezbollah operatives were linked to an attack on Israeli consul David Kimchi. The attack failed to injure Kimchi but wounded eight Turkish civilians. In short by any rational standard, Hezbollah is a terrorist organization. Both the United States and Europe helped to suckle the most recent three decades of terrorism through years of appeasing Palestinian terrorists such as Yasser Arafat. But this one is totally on Europe. The US declared Hezbollah a terrorist organization in 2004 under George Bush, but Obama has maintained this policy. Therefore the spotlight is on Europe, will they continue to appease thus siring the next round of people who believe terrorism is a legitimate form of political expression? Or will they stand up and be counted amongst the nations that who believe terror is abhorrent?